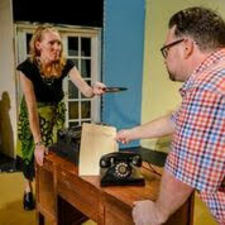 Old Courthouse Theatre Presents "Deathtrap": What Are You Willing To Do For Success? The Deathtrap cast, starting from the left: Robert Brafford, Vanessa Davis, Wil Lampe (sitting on couch), Cheryl Opel, Jonathan M Ewart. Photo by Jennifer Lancaster Ritchie. The Old Courthouse Theater is notorious for their fantastic stage performances in local Concord. The community theatre oftentimes likes to put on new and exciting performances, as well as classics, such as Music Man, which they will present next April. 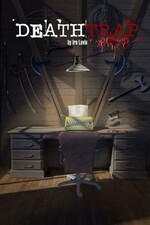 Their upcoming show, that will begin later this month, is Deathtrap, by Ira Levin. Opening night will be September 29th, 2016, and 8pm at the Old Courthouse Theater. We had a few questions regarding the upcoming performance, so we got in touch with a few people working on the current production of Deathtrap to have them answered. Tell us about the upcoming show, Deathtrap. What is the overall plot? A playwright who has had several past flops, invites a young wannabe playwright to read his script. The idea comes to him, "Can I take this script and make it mine?" What are you willing to do for success?? What is the cast/director most excited about for this show? To bring a thriller that we have never done to see the audiences' reaction. Also, for the surprise and shock that the audience will get when they see this production. Phil Taylor, the director of Deathtrap, said, “I am excited for the audience to see amazing actors that are in this show." How can someone get tickets? Either call the box office at 704-788-2405 or online at www.showtix4u.com. What are the dates for the show? Show runs September 29, 30, October 1, 7,8,14,15 at 8:00 pm and October 2, 9, and 16 at 2:30 pm. For more information about this show and others, you can visit the Old Courthouse Theatre website.